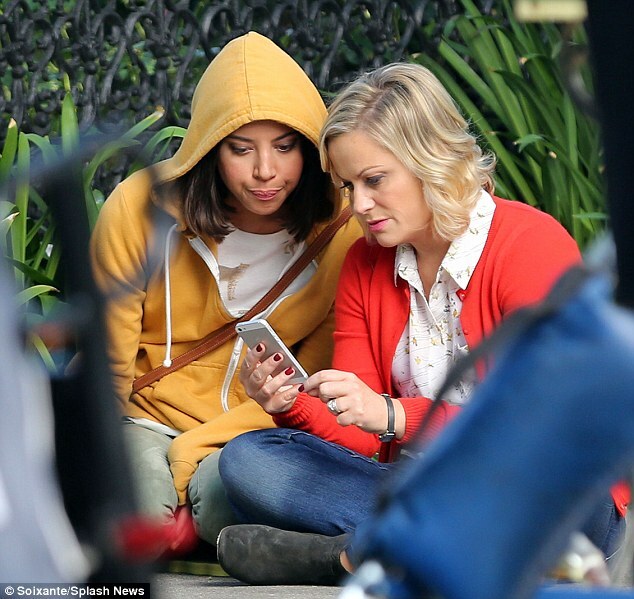 Work really is just a walk in in the park for Amy Poehler and Aubrey Plaza. The 41-year-old actress and her co-star, 29, got some fresh air while filming Parks and Recreation in Los Angeles on Thursday, but the normally jovial pair were in super serious mode. With a mustard yellow hoodie pulled over her head, Aubrey, who plays cynical intern April Ludgate-Dwyer, looked like she was going undercover on a secret mission. Lead star of the NBC hit, Amy, was her usual casual self in a floral blouse, jeans and a mumsy red cardigan. 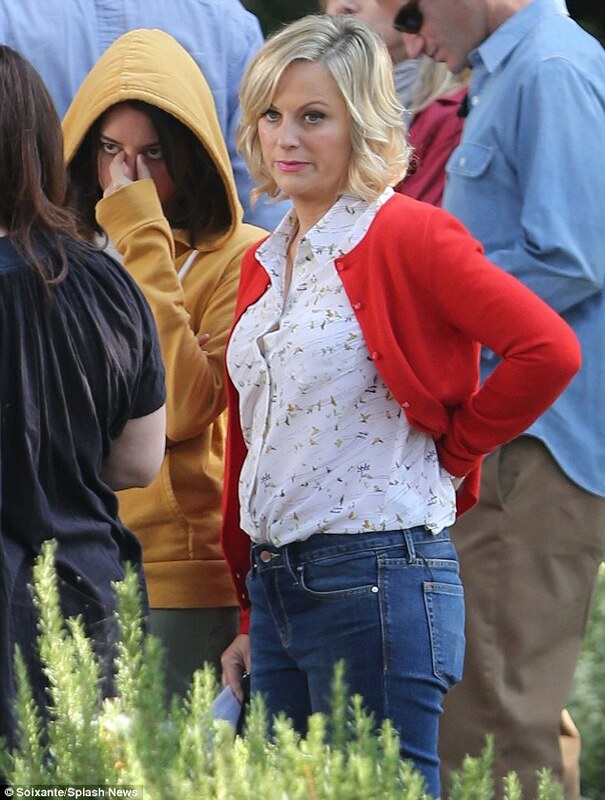 Her character, Leslie Knope's natural optimism seemed to be somewhat soured by whatever they were filming, however, as the actress kept a focused expression on her face. In one scene the pair are hunched over an iPhone and appear to be plotting something or deciphering a secret text message. While former Saturday Night Live star Amy later broke out into a big smile and was spotted laughing on the busy set, Aubrey maintained her signature ironically blank expression. The resulting quirky character has since become renown for her dead pan personality and her enduring affection for on-screen boyfriend, Andy Dwyer, played by Chris Pratt. Younger actress Aubrey recently revealed that she has a girl crush on her Parks And Recreation mentor, Poehler. 'She’s already kind of my girlfriend, and I’m not saying that in a jokey way,' Plaza revealed to Rolling Stone magazine. This may be news to Poehler's real life boyfriend, Nick Kroll, who is six years her junior. The couple first went public with their relationship earlier this summer at the AFI Lifetime Achievement Award in May, and the 35-year-old comedian is her first partner since she split from husband, Will Arnett, in September 2012.